We Came, We Saw, We Camped. 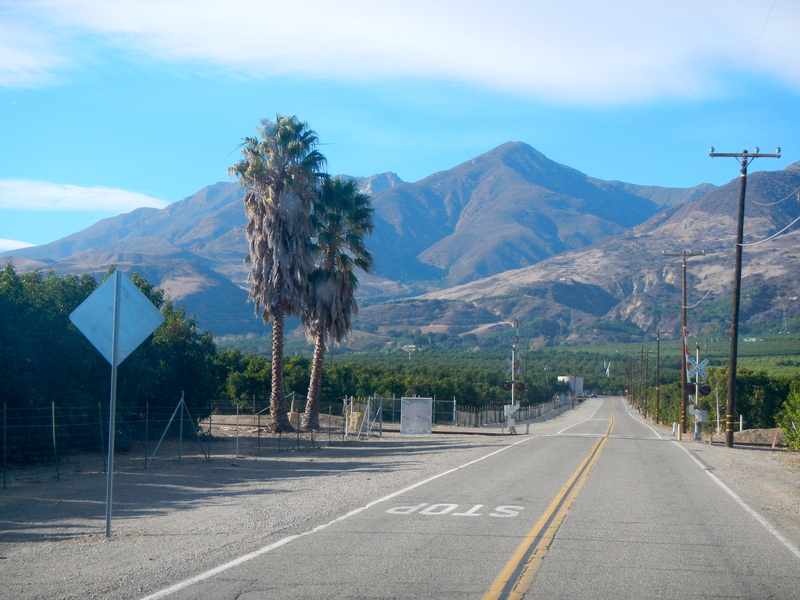 Milepost 2540: Fillmore, CA. Elev. 469 ft. 30 miles from the ocean. 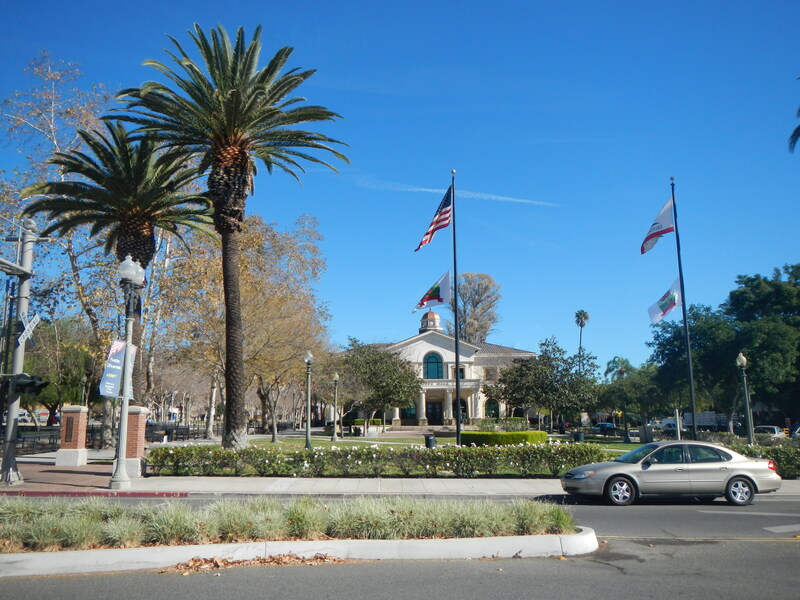 We have safely arrived in our winter home at Fillmore, California, where I have signed on to a work-camp assignment for the next five months, earning a free campsite. We have been out and about exploring this old railroad town where the Mexican restaurants and markets outnumber all others combined. The mountains loom over the town in this shot taken a half mile from our park. It is a pleasant little town with palm-lined streets, occupying the floor of a wide and verdant valley surrounded by parched mountains – they are in their fourth year of drought here. 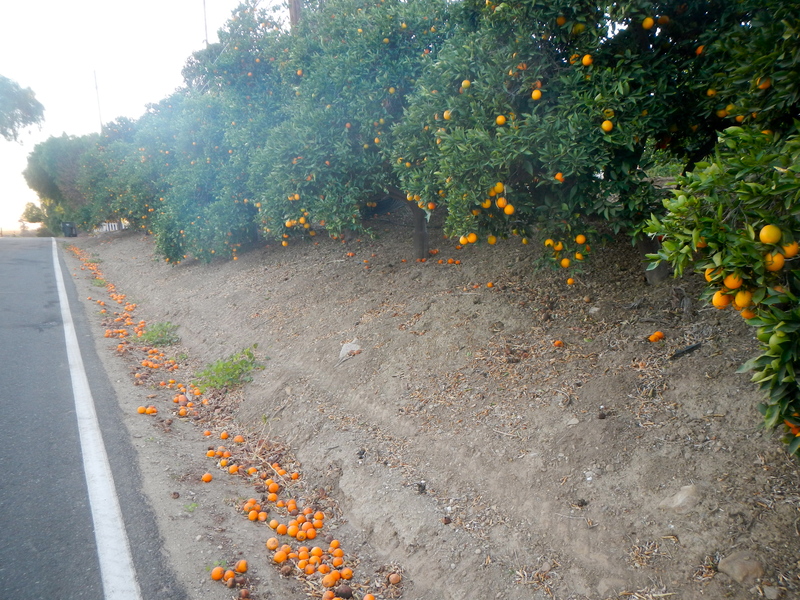 The valley is irrigated and the orange groves are full of fruit right now, spilling windfalls into the ditches. The orange groves are loaded with the current crop of fruit near our camp. The central park in Fillmore is lined with palm trees and backed by old railroad trains. 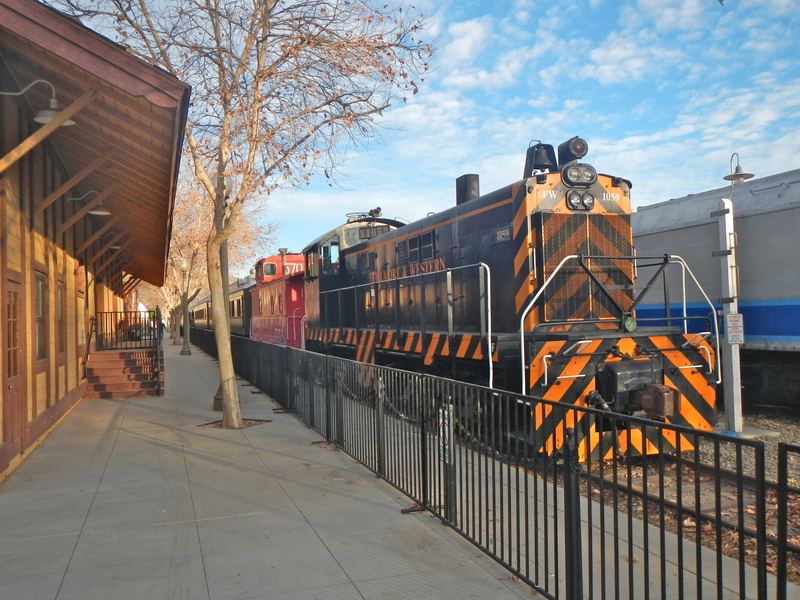 Fillmore boasts a large railroad museum with train cars and locomotives from several eras. Upon setting up the RV, we found our sewer line too short and had to run to the store to buy another section. The nearest Walmart was over the mountain ridge in Simi Valley. Our satellite maps did not prepare us for the topography on this quick jaunt. 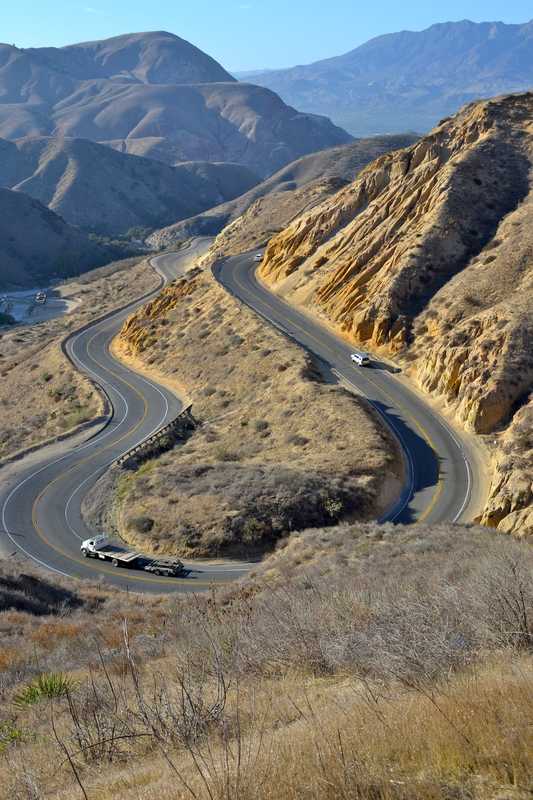 The mountain road was a tangle of switchbacks and hairpin turns climbing steeply – and populated with double-bottom gravel trucks heading to and from the quarry. It left our nerves an equally tangled mess. A quick trip to Walmart requires both hands on the wheel and eyes on the road at all times. 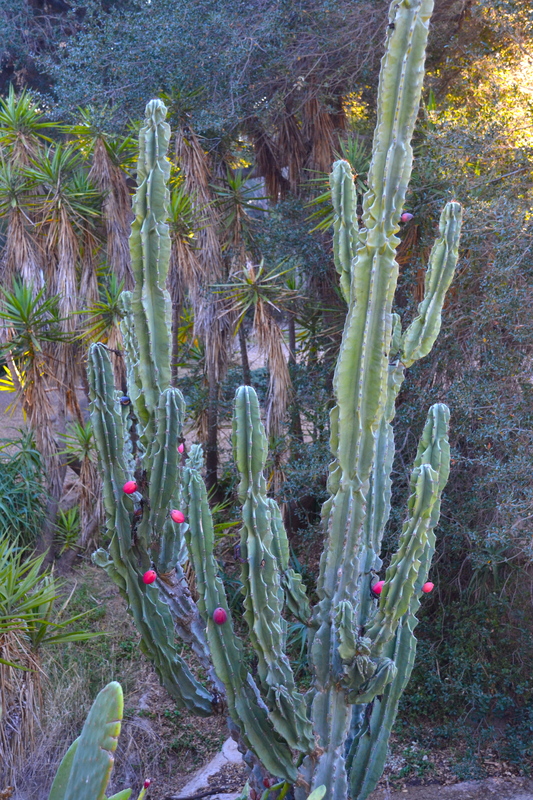 Kenney Grove Park is a scenic garden of eucalyptus, sycamore, palm, pine, oak and cactus. 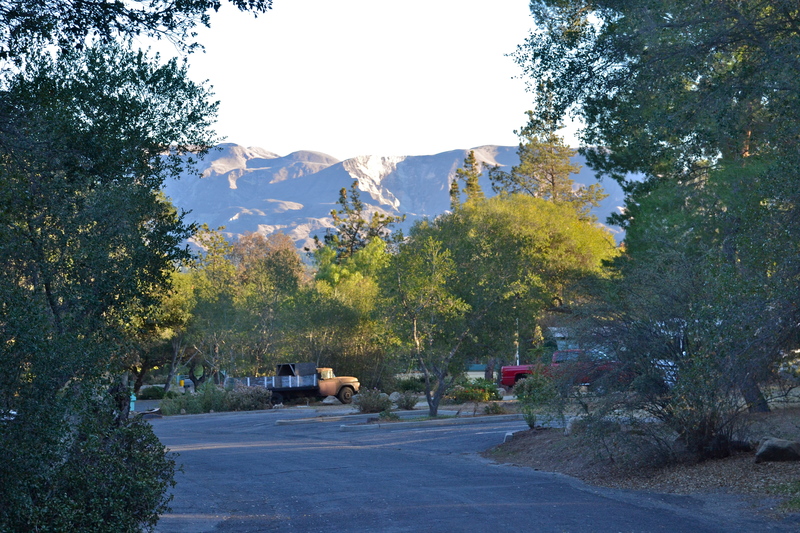 Kenney Grove is a sprawling park nestled in the valley below 4,000-foot peaks. I’ve already had a lengthy orientation into my job as handyman and part-time camp host. I consider it a privilege to add my effort and attention to such a picturesque slice of the world. It helps that I am missing the blizzards back home in Michigan while I work in short sleeves in southern California where it is 70 degrees and sunny every day. 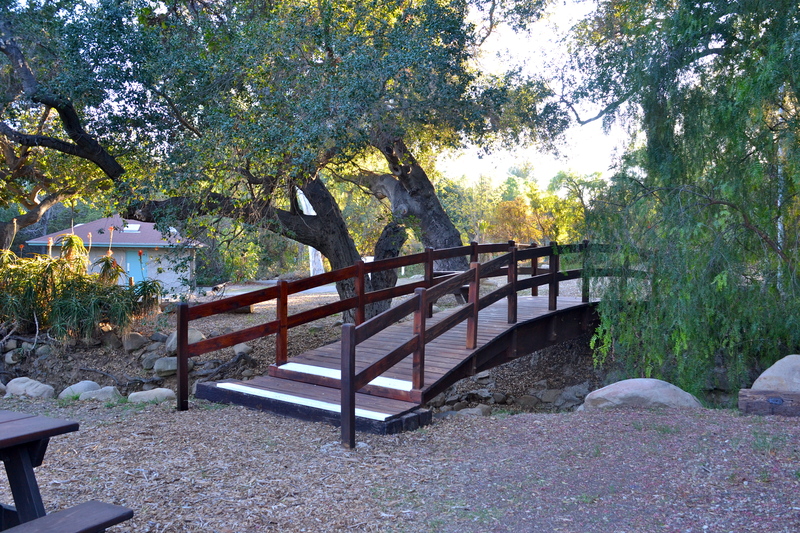 My first task here is to re-coat this foot bridge, one of three spanning a dry creek bed in the park. This afternoon I got my bike out and took off to the explore the local bike trails, my first ride since October in Michigan. There are paved trails here, some following the old railroad grade and some following the levee along Sespe Creek (which is totally dry right now) upstream toward the condor sanctuary a few miles into the national forest to the north of us. 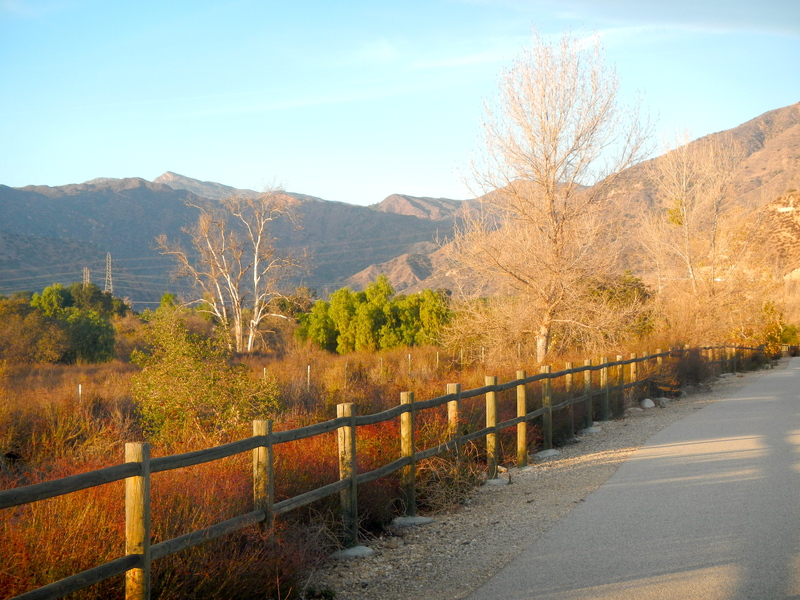 The bike trail along the dry Sespe Creek bed reveals the mountains behind the camp. Tomorrow we get to head up to Santa Barbara along the coast highway to visit our kids who work and study there in the winter. I wonder what marvels await us there. What an awful place to be. Admit it, you miss the ice, snow, and frigid temps!